With the 1L Base 0mg Born To DIY Le Petit Vapoteur, manufactures this e-liquid available for all. 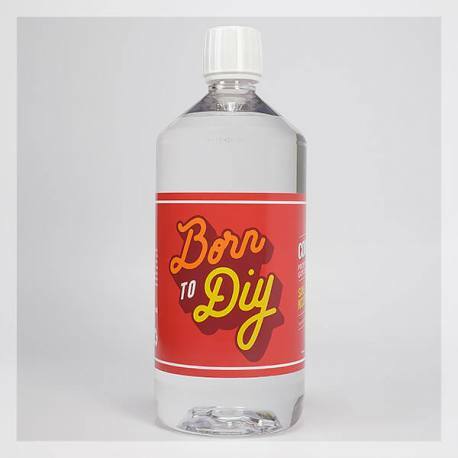 The Born to DIY Base is ready to use, simple enough just add the aroma of your choice. A 1L base without nicotine meets standard forced base, pharmaceutical quality with a compostion of 30% Propylene Glycol (PG) and 70% Vegetable Glycerine (VG) for a good balance between vaping and flavour. Prepare Rapidly and Simply your e-liquids with the base without nicotine. The base 0mg in nicotine Born To DIY is ready to use, simple enough to add the aroma of your choice, eventually with additives if needed. To prepare the liquid in 30/70 - PG/VG, it is generally advised to add 10% to 15% of aroma. The 1L E-Liquid Base Born To DIY meets pharmaceutical quality standards. With the composition 30% in Propylene Glycol (PG) and 70% Vegetable Glycerine (VG) for a good balance between flavours and vape. Base without Nicotine is Conditioned in a 1L bottle with a spout to prepare large quantities of liquid. Child Protection Seal.